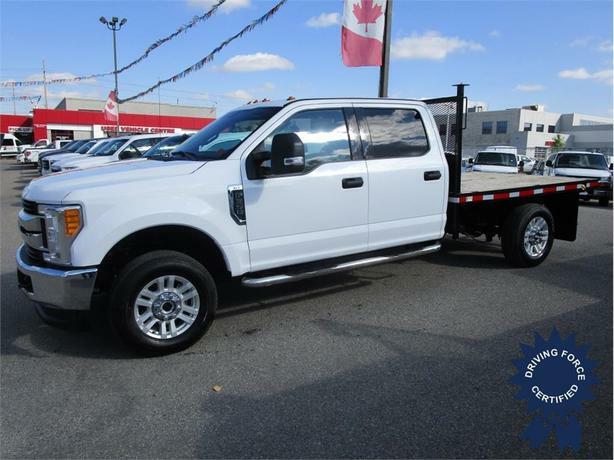 This 2017 Ford F-350 Super Duty XLT Crew Cab 6 Passenger 4X4 9-Foot Flat Deck Truck comes with a 179-inch wheelbase, 60-inch cab-to-axle, TorqShift 6-speed automatic transmission with over-drive, electronic-locking with 4.30 axle ratio, 18-inch sparkle silver painted aluminum wheels, trailer brake controller, transfer case skid plates, manual transfer case, towing with harness and trailer sway control, HD shock absorbers, front and rear anti-roll bars, firm suspension, hydraulic power-assist steering, manual locking hubs, SYNC Communications and Entertainment System, including voice-activation, USB port, 911 Assist, steering wheel mounted controls, 4-way driver seat with manual recline and fore/aft movement, 4-way front passenger seat with manual recline and fore/aft movement, three 12V DC power outlets, power door locks, power windows, keyless entry, front tow hooks, side steps, 151.4-litre fuel tank, HD 200-amp alternator, and GVWR rating of 11,400 lbs (5,170 kgs). The 6.2-litre V8 gas engine provides 385 horsepower at 5,750 RPM and 430 lb-ft of torque at 3,800 RPM. Touch base with us to discuss purchasing or financing options that are right for you and experience the difference you will only find at DRIVING FORCE Vehicle Rentals, Sales and Leasing.